How do you save a picture of your iPad screen? 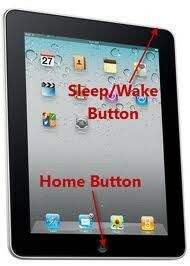 If you would like to save what is on your iPad screen to your photos, all you have to do is press your home and Sleep/ Wake button at the same time. You will here a clicking noise. The screen shot is now saved to your camera roll. Want to Find Free Apps! There's apps for that! Apps change in price often, they even go FREE! To find out Apps that have gone on sale, or are free, download one or both of these Apps. Make sure you download the Apps when they are free, because most of the time it is a limited offer! The two apps I use are "Apps Gone Free" and "AppsFire"